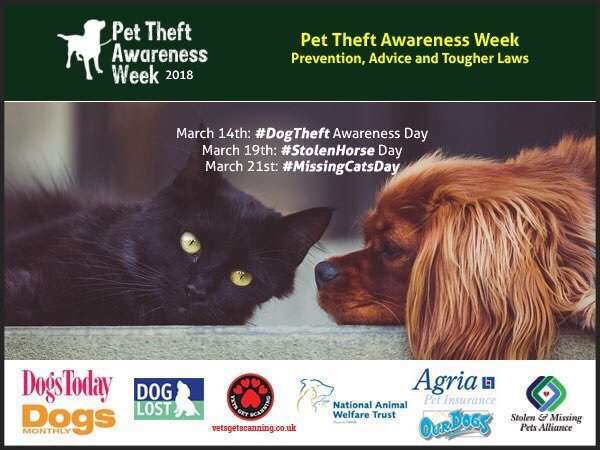 DOG THEFT AWARENESS DAY STARTS PET THEFT AWARENESS WEEK 14th – 21st March. 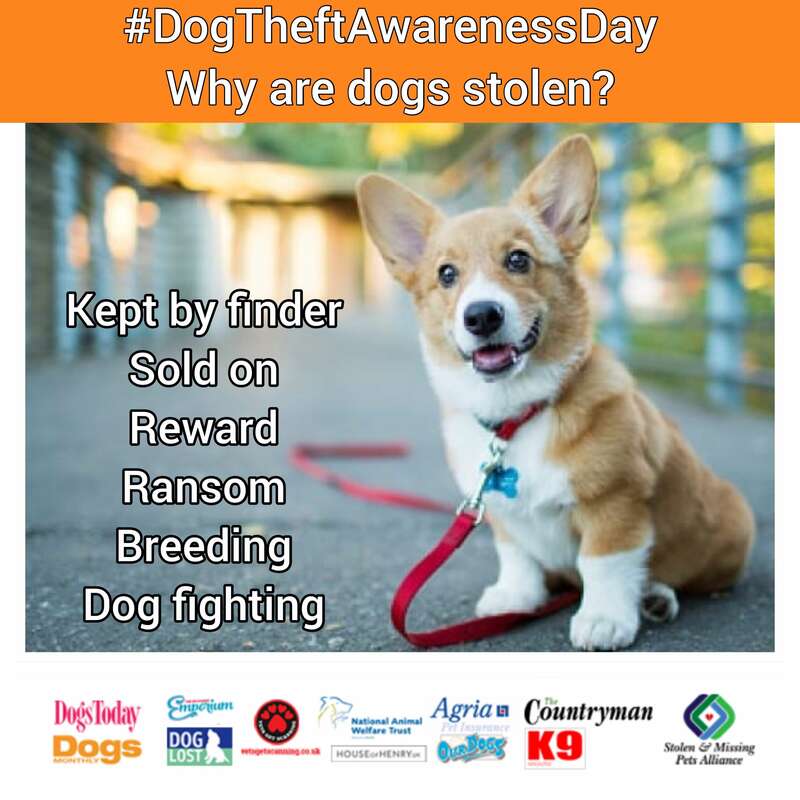 The Stolen And Missing Pets Alliance’s (SAMPA) Dog Theft Awareness Day is in it’s third year, an annual event held on 14th March. Prevention and Advice is top of the agenda while explaining why we need tougher laws to act as a deterrent to protect all our pets. No one is safe from this crime, which hits families, the elderly and the disabled. The loss of a companion and family member is devastating. 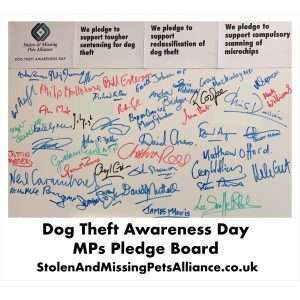 With dog theft on the rise it’s a salutary reminder to all pet owners that no one is exempt from this vile crime. FOI figures from the police reveal 5-6 dogs are stolen everyday in England and Wales. This is just the tip of the iceberg as figures for ‘Theft By Finding’ are never included. In reality Doglost say more than 60 dogs are snatched every week. 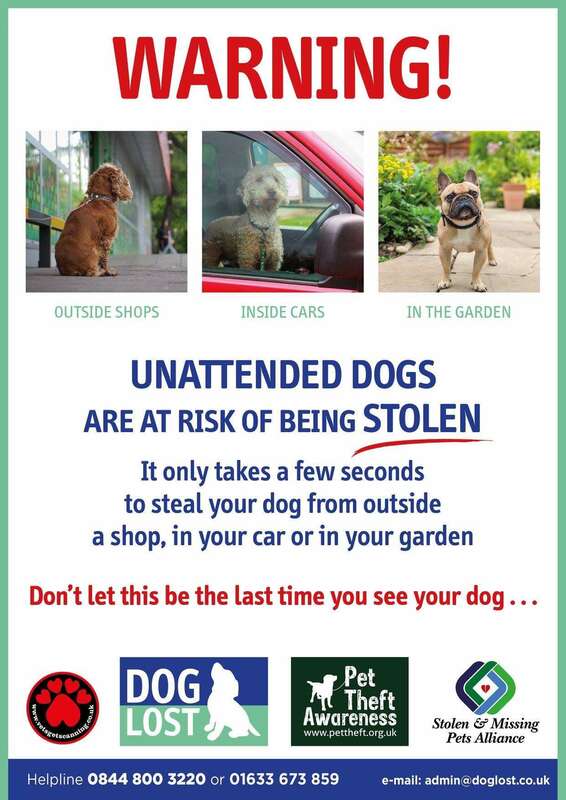 Dogs are stolen from gardens, houses, parks, kennels, outside shops and cars. Nowhere is safe. Any breed is stolen but designer toy breeds and gun dogs are particular targets. Thieves even steal litters of puppies! Reward or ransom for return can be demanded but most dogs are sold on to unsuspecting new owners, with some being used for breeding and worse dog fighting. The Dog Microchip Regulations were only instigated to save money on stray dog kennelling and sadly the microchip system fails to help missing pets get home. Although it is compulsory to microchip our dogs it is optional for the veterinary profession to check pet and owner match, even though they state it is best practice as a recommendation, this loophole remains. 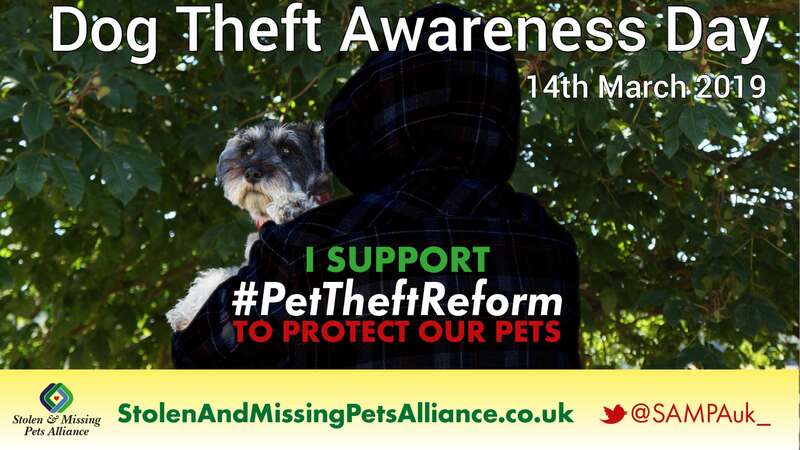 Last year, SAMPA Patron Dr Daniel Allen’s Pet Theft Petition was asking for ‘pet theft to be reclassified as a crime in its own right’ it reached 100,000 signatures in just four months, this illustrates the strength of feeling on the issue. We need the Government to act now to protect our pets. 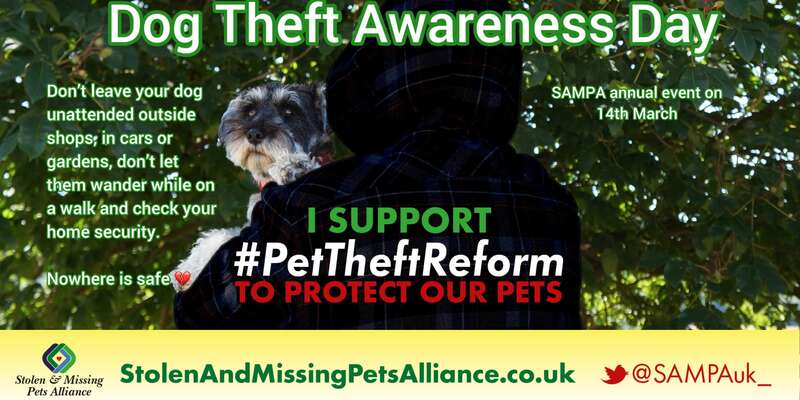 A change in the law is necessary to deliver justice for victims of pet theft as well as to work as a deterrent. Make sure your garden, house and outside kennels are secure. Your dog’s microchip database phone number. Check your contact details are correct and up to date and flag as missing. Contact DogLost (01633 673859 or www.doglost.co.uk) email admin@doglost.co.uk. Poster, poster and poster again. 52% of dogs are stolen from gardens. NO WHERE IS SAFE ANYMORE. 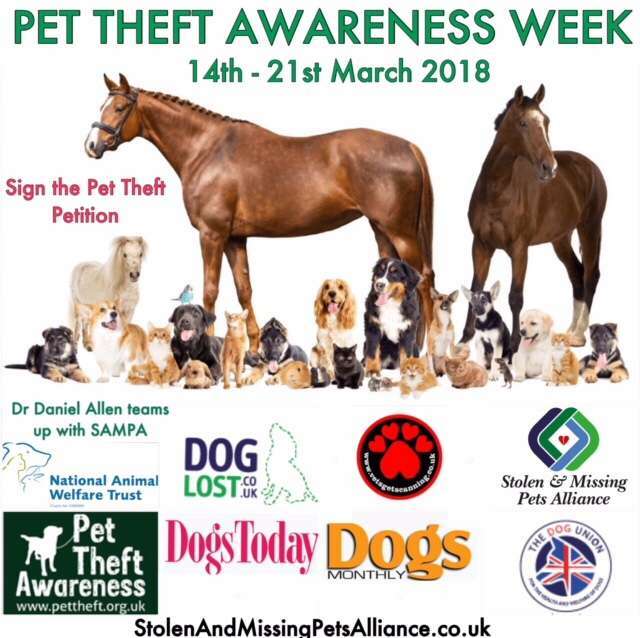 We are proud to add the National Animal Welfare Trust as a supporter:- National Animal Welfare Trust (NAWT) has become the first animal welfare charity to support the #pettheft petition launched by the Stolen and Missing Pet Alliance (SAMPA). Our pets are categorised as ‘property’/ ‘personal items’ in law which explains why Pet Theft is on the increase. The punishment does not fit the crime and this is why we need the Government to Reclassify the theft of a pet to a specific crime in its own right. Paula Sherriff MP for Dewsbury, West Yorkshire. Labour. John Stevenson MP for Carlisle, Cumbria. Conservative.